This might be the most important preaching principle I’ve learned. When I first began preaching, I took an entire manuscript on stage. It was a pastoral security blanket – except not pink and fuzzy. I tried not to read it directly, and in most cases, I was successful. But in my mind, it was good to know it was there… just in case I needed to snuggle. Great content without great connection is poor communication. And that was my problem. I communicated clear content without any relational connection, and it wasn’t working. I was more focused on WHAT I was saying than WHO was listening. I was mentally focused on my place in the manuscript rather than on the people in the room. But, the goal of preaching is not getting through an outline, but giving people a truth they can apply. Unfortunately, my manuscript-tracking mentality was holding my focus hostage. For me to improve, the security blanket had to go! One fateful Sunday morning, I did something huge – I walked on stage with my notes in my back pocket – and I was terrified. My little round table sat empty. Both it and I felt naked. It wasn’t my best message. It’s hard to preach terrified! But my connection to the crowd improved. The next week I left my notes in the green room. I almost puked, but I made it through. Since then, I’ve never looked back. And you know what? My connection keeps improving. The principle is simple. I moved from being message-focused to people-focused. Sure, I still work hard on the content, but I moved my stage focus from the message to the people hearing the message. That is a game-changer. 1. Preach a journey, not an outline. A great message takes an audience on a journey, beginning together at a point and traveling as a group to the final destination. I have found structuring my message like a journey helps me both remember the content and stay focused on the audience. A journey is simpler than an outline. Today, I only memorize exit points along the path instead of multiple paragraphs in a manuscript. This frees up mental energy to refocus on the audience. There’s nothing biblical about preaching a three-point sermon, even if your seminary tried to convince you otherwise. If you’re lucky, people will remember only one thing you say anyway, so why fight your crowd’s natural instincts? Besides, one great point is better than three alliterated sub-par points read from an outline. And … one point is easier to communicate if it’s part of the message journey (see hint 1). 3. Preach to one person in the room. This is the best advice I ever received on connecting. Before I write a message, internalize a message, or preach a message, I ask myself, “How would I say this in my office to one friend?” I know – not earth shattering – but so helpful! Ask yourself this one question the next time you preach and see what happens to your message. If you want to connect with everyone, preach to just someone. 4. 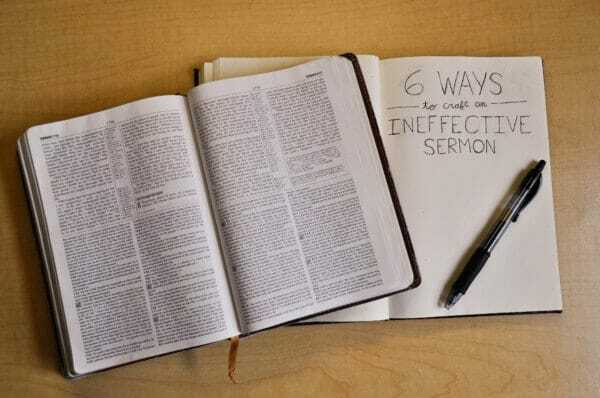 Practice your sermon … a lot. I typically rehearse a message 3-5 times – and I only stop practicing when I feel comfortable enough with the content that I can walk on stage with my target set on the congregation. When you are worried about what to say next, it becomes impossible to focus on the people listening. I thought taking notes on stage would help relieve my worry, but it only changed the problem. I now rehearse until I can deliver the content effortlessly. By the way – Anytime something looks effortless, you can guarantee that person spent hours and hours of effort to make it look that way! I don’t understand the preacher who has a “preaching voice” and a “normal voice.” Just be you up there. Be normal. How? Stop pretending to be someone else. That’s a good start, because you will never fully connect if you aren’t you. I work for Andy Stanley, so I stand in a GIANT preaching shadow when I preach. It’s so tempting to mimic a communicator like Andy, but mimicking Andy only takes away me, and YOU cannot connect as someone else. Borrow what works, but be you. 6. Be transparent and honest. Few things connect better than honesty. We should be comfortable sharing our struggles (to a point, of course). We are real people, but pretending we’re not creates an obstacle to connection. If you want to see this in action, watch part 3 of my marriage series. People resonate and connect to other people, so be a real “people” on the stage. If you can’t connect, you can’t communicate. We’d love to hear from you: How have you learned to connect? What secrets have you discovered? Gavin Adams serves as the Lead Pastor of Woodstock City Church, a campus location of North Point Ministries. He is a Ministry Consultant with The Unstuck Group, and writes to help others make leadership and faith transferable at GavinAdams.com. Thanks for this. I found it very helpful and encouraging. I’m going to take it to heart and apply it.